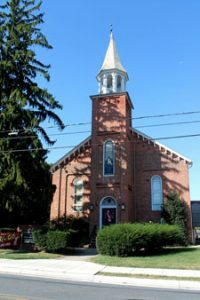 One night in the Spring of 1854, Messrs. Joseph Brown, William Metzger and James S. Gladhill, then members of St. John’s Lutheran congregation at Church Hill, met together to discuss the advisability of erecting a Lutheran Church and organization in nearby Myersville. Rev. Christian Startzman, then pastor at St. John’s, was consulted, and gave the project a hearty approval. It was then determined that a church be built and accordingly, a lot – the one on which the present church stands – was purchased and a building committee was appointed. The work on St. Paul’s Lutheran Church was commenced and in the Fall of 1855, this first Lutheran Church in Myersville was dedicated. The total cost was $3,100. However, in April 1872, a fire destroyed the church. In 1874, St. Paul’s Lutheran Church was rebuilt and rededicated at a cost of $7,000. Over time, improvements and additions were made to the church in Myersville and today, it continues to serve its Lutheran congregation as well as the local community.